Create a flawless finish in 2 simple steps with the Wolfgang Duo. Create a flawless finish in 2 simple steps! Correct paint problems both big and small with the Wolfgang Duo! Wolfgang Total Swirl Remover 3.0 and Wolfgang Finishing Glaze 3.0 restore all types of automotive paint in just two steps. Wolfgang Total Swirl Remover 3.0 is a hybrid of our original Total Swirl Remover formula and a cutting-edge polish for ceramic clear coats. It combines Wolfgang's diminishing abrasive technology with a special milling process only available in Germany, which produces consistently sized, fast cutting abrasives. The results are two professional grade car polishes that will remove a wide range of imperfections and restore a showroom shine to your vehicle. Take advantage of this great offer! Receive this 4 piece kit for even less than the price of the two polishes. Consider the towel and 5.5 inch pad our gift for trying Wolfgang’s ultimate swirl removing duo! A total retail value of $103.96, you save $23.97! 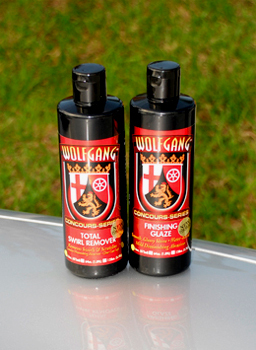 I love the Wolfgang products, easy to use, and my truck looks brand new when finished. My truck looks like it did when I drove it off the dealer lot. No swirls or fine scratches in when done. You can not tell a buffer was used. I have received numerous compliments of how new my truck looks. Now all my friends want me to do theirs. Excellent product to get the swirls out and bring the glaze in your car when used with a good buffer/polisher.